Crusaders marched five points clear at the top of the Danske Bank Premiership on Tuesday night after a 6-1 demolition job of Glenavon at Mourneview Park. Jordan Owens with three, Gavin Whtye grabbed a double and Paul Heatley was also on target. Mark Sykes got Glenavon’s only reply in what was a disappointing night for the home side. Crusaders were men on a mission last night and it would be hard to see them imploding like they did last season - when Linfield claimed the title right at the death. The Crues had the first chance of the match in the third minute but Heatley’s shot was blocked after keeper Jonathan Tuffey had spilled a cross. It was an early let-off for the home side who were trying to regroup after Saturday’s exit to Loughgall in the Irish Cup. A minute later the home side could have taken the lead. Stephen Murray crossed to Josh Daniels - who was totally unmarked. However he hesitated and shot straight at Brian Jensen when he should have scored. In the 11th minute Glenavon’s Sammy Clingan sliced a clearance. It fell to Heatley who tried to push the ball past Tuffey - who did well to gather the shot. It was 1-0 to Glenavon in the 17th minute as the ball fell to midfielder Sykes - who walked past a defender after playing a one two with Daniels - before rifling home past Jensen. A great finish from the young midfielder and Glenavon were up and running. In the 26th minute it was 1-1 after a suicide ball from Glenavon’s Rhys Marshall. His misplaced pass put Crusaders striker J Owens clean through and he rounded Tuffey to score the equaliser. Ten minutes before the break the Crues Whtye hit one from range but Tuffey pushed it away at full stretch. It was penalty to Crusaders in the 39th minute after Andrew Doyle handled in the box. Whyte stepped up and rammed it home from the spot to give his side a 2-1 lead. One minute after the break Glenavon’s Clingan tried his luck from a free-kick but it was easily gathered by Jensen. It was 3-1 in the 48th minute. Whyte threw in a ball and Owens finished off with ease to grab his second of the night. 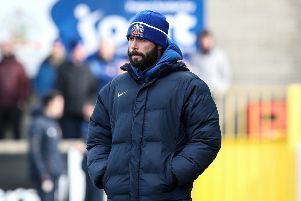 It was not the start to the second half that Glenavon manager Gary Hamilton would have wanted as his side now had a mountain to climb. The mountain got even bigger two minutes later as Whyte made it 4-1 with a fantastic finish from outside the box. Glenavon’s Murray then his luck in the 55th minute as the home side looked to respond but his shot was easily saved by Jensen. The game became scrappy with Stephen Baxter’s side happy to sit on their lead while Glenavon huffed and puffed but created very little. Then it was 5-1 in the 72nd minute as BJ Burns released Heatley and he lobbed the ball over the advancing Tuffey in the Lurgan Blues goal. Glenavon substitute Griffan tried his luck shortly after but his deflected shot was saved by Jensen and that about summed up Glenavon’s evening. Then to add insult to injury Owens completed his hat-trick near the final whistle o compound Glenavon’s misery. Glenavon:Tuffey, Burns, Marron, Doyle, Marshall, Mitchell, Daniels (McGrory, 56mins), Sykes, Clingan (Foley 62mins), Murray (Griffan 72mins), Singleton. Subs not used: Lindsay, Norton. Crusaders: Jensen, Burns, Beverland, Whtye (Cushley 89mins), Coates, Lowry (Glakin 89mins), Ward, Caddell (Snoody,77mins), Forsythe, Owens, Heatley. Subs not used: O’Neill, Suarez.